A documentary following the journey of a young pipe band after tragedy struck is being produced for BBC ALBA, it has been revealed. 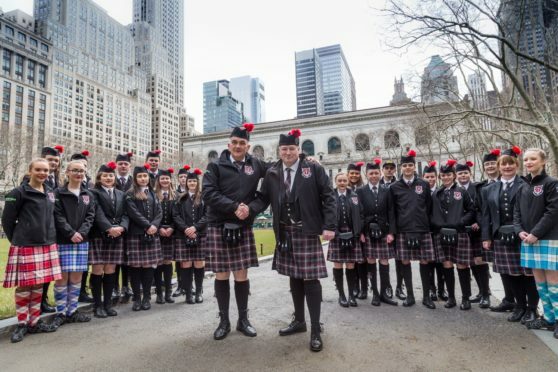 Sgoil Lionicleit Pipe Band, made up of secondary school students from Uist and Barra, are being documented as they take part in New York Tartan Week. It is the first time the pipe band have attended the event, and the motivation came after band member, Eilidh MacLeod, was one of 22 victims of the Manchester bombings in May 2017. Gaelic media company MacTV have been following the pipe band as they began fundraising for their trip. David Martin, producer for MacTV, says: “When we heard that Sgoil Lionacleit Pipe band were taking part in the Tartan day parade we thought it was a great opportunity to follow them. The New York Tartan Week, which is in its 20th year, celebrates Scottish culture and centres around Tartan Day. The documentary will air in the Autumn on BBC ALBA.